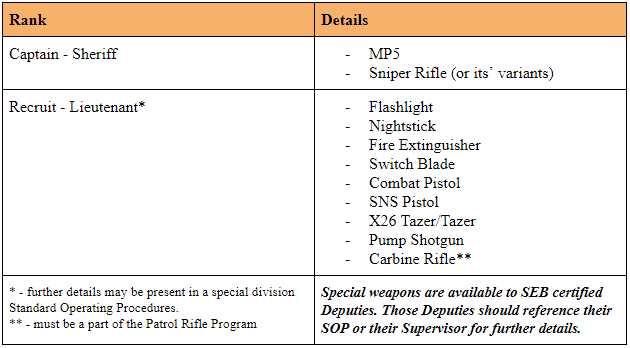 Deputies have a variety of tools that are provided to them to make sure that Los Santos is protected. This includes uniforms, weapons, and vehicles. 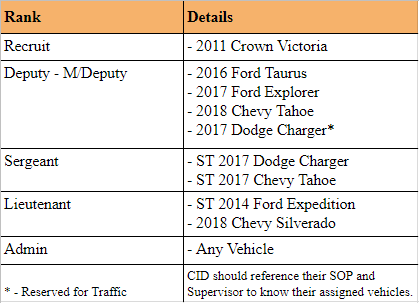 The following outlines the tools that are authorized to the different ranks of the Department. Policies regarding the equipment may be outlined later in the Handbook. Some Deputies may be authorized to special equipment based on certifications that they have. Those authorizations are not mentioned in this handbook, touch base with your supervisor if you have questions regarding a certain tool. Certain exceptions may be made to allow a Deputy to use equipment that they are normally not permitted to use. Exceptions are only authorized by the Captain and higher. If you are not formally instructed how long your exception is for, assume it is only for the day and return to using your authorized equipment after that day. On duty Command Staff have all rights to end an exception if the original Command Staff member who authorized the exception is no longer on duty as they are the active Watch Commander. All structures below are hierarchical, meaning that the higher ranks inherit items from the lower ranks.